The magnificent desert falls on the White River survived a close brush with disaster this month, when a throwback proposal by Wasco County to divert the river as part of a new hydropower project was scrapped. Like so many hydro projects of decades passed, this one would have had “little impact”, according to proponents. Yet, as we take in the summertime view of the 90-foot plunge pictured above, it’s obvious that diverting the river would have an immediate impact on the natural beauty of the area. Would half the falls be diverted? Two-thirds? All of it? Though the Wasco County proposal was ultimately dropped because of concerns voiced by the Oregon State Parks Commission, it wasn’t for lack of “goodies” offered up in exchange for the diversion. The County promised trail improvements for recreation, and interpretive facilities for the structures left behind from the last hydro project here. 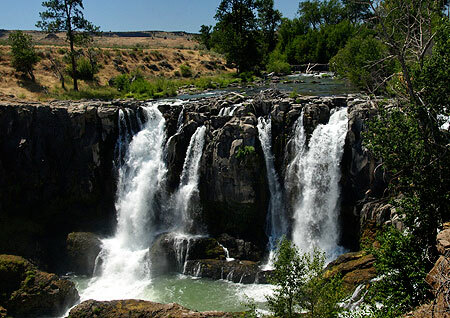 The falls and adjacent White River Gorge are truly a forgotten gem in Oregon, save for a few fishermen in spring and fall, and a lot of teenagers in summer, seeking out the swimming holes below the falls. 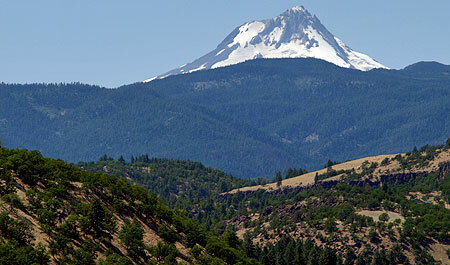 Yet, the area is only two hours from Portland, and offers some of the most accessible desert scenery in the state. 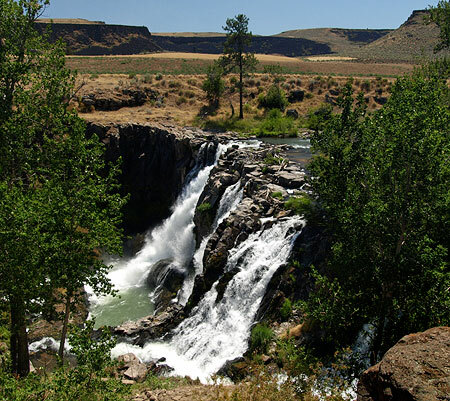 In recent years, hikers have begun to explore the area, following boot paths and game trails downstream toward the confluence with the Deschutes River, just over two miles below the falls. What most visitors don’t know is that much of the rugged backdrop for the falls is private land. Most surprisingly, these private holdings include the most of the White River gorge, all the way to the Deschutes confluence, and this beautiful area has somehow escaped development over the years. With Wasco County politicians dreaming up hydro projects for the White River, this article is intended as a more forward-looking counterpoint that actually embraces the scenic and recreational values in the area. As a starting point, the National Recreation Lands boundary that encompasses the larger Deschutes Canyon could be expanded to include White River Falls, White River Gorge and the adjacent Winter Ridge and Devils Halfacre areas. This could provide the direction needed for state and federal land agencies to begin acquiring private land and planning for recreation. It’s unclear what the “National Recreation Lands” boundary actually means, however. It seems to mirror the Wild and Scenic River designation for the Deschutes Canyon on USGS maps, but may be an orphan from old federal plans and policies no longer in force. 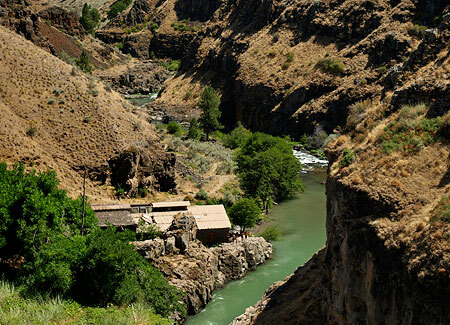 Current federal planning documents for the lower Deschutes Canyon are also badly out of date, so a better legal mechanism likely exists for recognizing the potential for recreation in the White River Gorge area. In the end, some sort of designation is needed to identify the extent of the new recreation area. The main focus of the concept is to build new trails in the White River Gorge, proper, and on the adjacent highlands that I’ve called Winter Ridge for the purpose of this article. 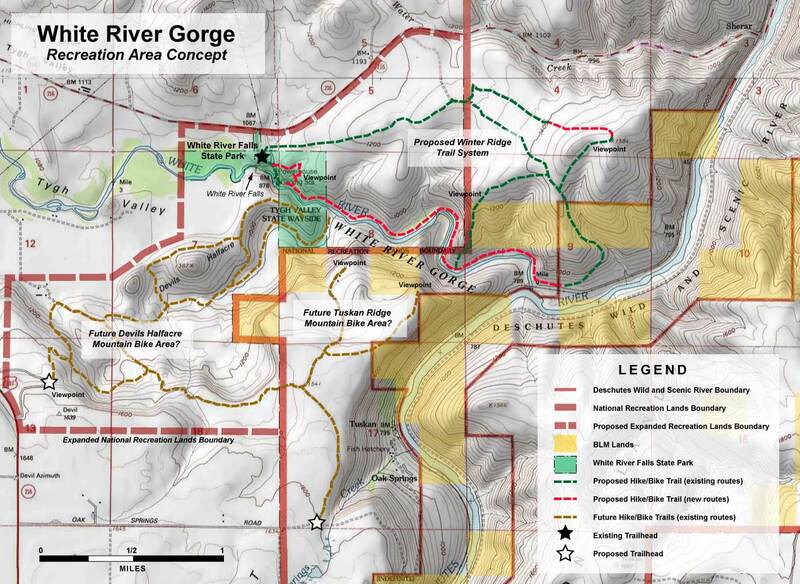 The gorge is mostly private land outside the present state park boundaries, so like all of the trail proposals called for in this article, a new White River Gorge trail implies public ownership or easement. The dashed red lines on the map show the new trail extending through the canyon from the falls to the confluence with the Deschutes, along with a short viewpoint loop within the current state park boundaries. This would become a premier hiking trail in the region, providing a unique riverside hiking experience in a roadless desert canyon. The first portion of this new trail would simply follow the existing route down to the old power plant, with a new loop climbing back to the trailhead, via a canyon viewpoint above the falls. This part of the proposal could be built now, as it falls entirely within the current state park boundary. The canyon trail would offer a unique interpretive opportunity where relics of the old power plant still exist. The Wasco County hydro proposal recognized the historic importance of these structures, and called for interpretive improvements along this existing trail, at the penstock and in the old power plant. These historic structures have been badly vandalized over time, and could greatly benefit from some modest renovation and protection. In addition to the White River Gorge trail, the proposal calls for a network of hike and bike trails over the broad slopes of Winter Ridge. 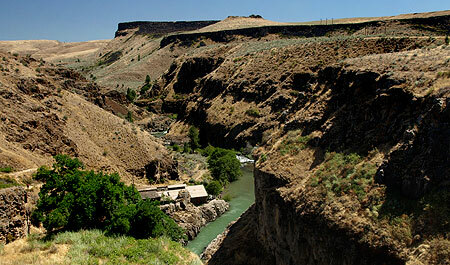 This area rises steeply above the confluence of the Deschutes and White rivers, with views nearly 800 feet down into the gorge from the open crest. The west slopes drop gently to the trailhead at White River Falls, with sweeping views of Devils Halfacre, Tygh Ridge, Mount Hood and Mount Jefferson. The proposed trails shown on Winter Ridge (in green on the map) are almost entirely along existing paths and roads, and would require little beyond signage to improve them for hikers and mountain bikers. Though a portion of Winter Ridge is farmed with winter wheat, much of the terrain is in a native state. The upper slopes of the ridge feature an odd landform unique to the Lower Deschutes River country: countless mounds of soil and rock, often organized in rows. They span 10-20 feet in width, and stand a few feet in height. These odd “desert mounds” appear on shallow slopes and hilltops throughout the Tygh Ridge area, and this would be one of the few areas where visitors could examine these mysterious formations, up close, and learn some of the many theories about their origin. It is impossible to stand at White River Falls and not notice the rugged, picturesque rim rock cliffs and massive bluffs that rise to the south of the White River Gorge. This rocky maze is the Devils Halfacre, and though in private holdings now, it offers an especially interesting potential for recreation. The area falls into two general units: the rocky gulch of Devils Halfacre, proper, and the huge mesa forming the east wall of the gulch, which I’ve called Tuskan Ridge for the purpose of this proposal (see map). A network of trails and dirt tracks already exists here, and could easily be adapted to become an exceptional hike and bike trail network. These trails would lead hikers, bikers or possibly equestrians past rugged rock formations to spectacular, cliff-top viewpoints. The Devils Halfacre area has excellent potential for trailhead access from both Highway 216 and Oak Springs Road. The terrain here rivals popular destinations in the eastern Columbia River Gorge, and would offer a unique chance to bring sustainable recreation tourism to the local economy. The concept presented here is just one way in which recreation and landscape restoration could be combined to preserve the White River Gorge area. The intense demand for mountain biking opportunities also offers the potential to transform the local economy, especially since the area is just far enough from the Portland metropolitan area to draw overnight and weekend visitors who could support local businesses. At a minimum, now is the time for Wasco County to aim for a more sustainable vision for White River Falls and its surroundings, instead of rehashing old, exploitive ideas that would degrade the area, and that have already failed here, before. The Oregon State Parks Commission was right to challenge the County’s attempt to turn back the clock at White River Falls. Now would be the perfect time for the County to partner with the Parks Commission and federal agencies to forge a new vision that does justice to the remarkable landscape that exists here. This entry was posted on March 29, 2011 at 9:30 pm and is filed under Cultural History, Natural History, Proposals. You can subscribe via RSS 2.0 feed to this post's comments.